If you are not already familiar with the principles and parts of such engines you can readily become so by studying figures 2, 3, 4 and 5. Figures 2 and 3 give views of the complete engine and boiler taken from opposite sides. Figure 4 gives the interior construction of a boiler, and figure 5 the section of an engine and accessories. Look at figure 5. When the throttle-valve on the pipe which connects the boiler with the engine is opened, steam rushes into the valve-chest K. If the engine does not move, it is turned forward a little by hand, which will cause the valve V to move to the left. 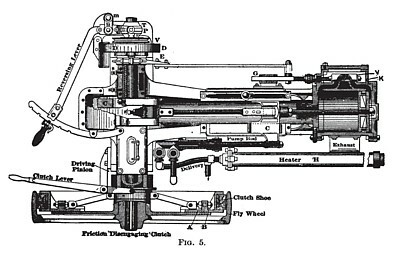 This motion uncovers the steam passage or port leading into the right-hand end of the cylinder, and the steam rushing into that end of the cylinder pushes the piston P over to the left. Any air or steam in the other end of the cylinder will be, driven out through the port into the exhaust, and through the heater into the open air. The piston will move to the left about one-quarter of its whole motion, the valve also moving in the same direction, but as the valve is operated by a stem driven by an eccentric wheel on the main shaft of the engine, it will, at about this time, commence to move toward the right, closing up the port until when the piston has reached about one-third the distance to the left the valve has closed up over the port and shut off any more steam from going into the right-hand end of the cylinder. The steam will, however, expand and continue to press on the piston, driving it over to the right until it reaches the end of its course. At this time the valve has moved so far to the right that it uncovers the port leading to the left end of the cylinder. Steam rushes in at this end and drives the piston back again to the right, the valve cutting off steam from this end at about one-third of its stroke. The piston is connected by its rod to the cross-head C, and this cross-head, which moves to and fro under the action of the piston, is connected to the main crank-shaft by means of the connecting rod. By the well-known action of the crank and connecting rod the to-and-fro motion of the cross-head is changed into the rotary motion of the main shaft, which carries the driving wheels. So much for the engine proper: now for its accessories. 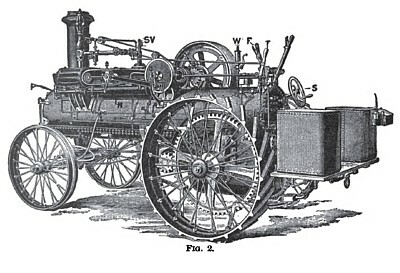 It is necessary to change direction or reverse a traction engine, and this is done by moving the reversing lever. In the middle notch the valve is in such a position relatively to the piston that no steam is admitted to the cylinder. Moving the lever to the left moves the eccentric, which operates the valve-stem and moves the valve so that steam is admitted to one end of the cylinder, and this will cause the engine to go in one direction. Now, if we throw the reversing lever to the other end of its course, the valve will be moved over so that it admits steam now to the opposite end of the cylinder from which it did before, and the engine will turn in the other direction. In order to stop quickly a brake is provided, operated either by hand or foot lever. When an engine is propelling itself along the road, the driving wheels turn, of course, much more slowly than the main shaft of the engine. The reduction in speed is obtained by gear wheels. If we want to quickly disconnect the slow-moving road driving wheels so that they do not turn even though the engine shaft is going at full speed, we move the friction clutch-lever F in the proper direction. Sometimes you may come to an obstacle in the road over which the engine refuses to go. You may, perhaps, get over it in this way: Throw the clutch-lever so as to disconnect the road wheels; let the engine get up full speed and then throw the clutch-lever back so as to connect the road wheels. 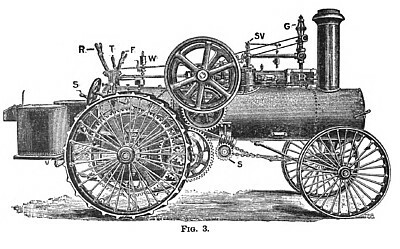 In figure 2, S is the wheel by which the machine is steered, W is a whistle, and T is the lever controlling the throttle; S V is the safety-valve, and G is the governor. The pump is shown in figure 5, and is operated directly from the cross-head. It takes water from the water-tank, and pumps it through coils of pipe in the heater to the boiler. The water is heated while passing through the heater, because the pipes through which it flows are surrounded by exhaust steam from the engine. 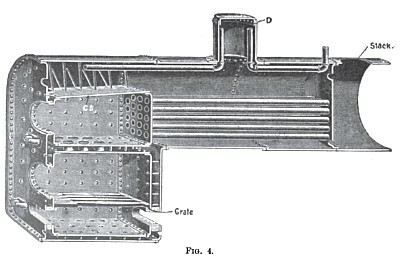 The general construction of a boiler is shown in figure 4. The flames and hot gases rise from the fuel in the grate and pass through the upper heating chamber, through the tubes, and into the stack. Water fills the cylinder to a level which must be kept above the crown sheet C S, and the heated water gives off steam which collects in the steam dome D, from which it is taken to the engine. The compound, or two-cylinder, traction engine has come into the market within the last few years, and is the result of trying to secure for farm engines the advantages known and realized for many years by stationary and marine engines. In such engines the steam, after passing through the first or smaller cylinder and expanding somewhat, is exhausted into the second or larger cylinder and allowed to expand completely. Two cylinders are used because we can in this way get better economy in the use of high steam pressure than with the simple engine. One hundred pounds of coal will raise a certain quantity of water from 60 degrees into steam at 5 pounds pressure; 102.9 pounds will raise it to 80 pounds; 104.4 pounds will raise it to 160 pounds. That is, by burning 1½ pounds more coal than we used for 80 pounds, we can raise it to 160 pounds, and this steam at 160 pounds run into the engine would give a large increase in power over what we had at 80 pounds for a trifling increase in coal burned. These engines will furnish the same number of horse power with considerably less fuel than simple engines, from 15 to 30 per cent. less, but only when they are run at nearly full load all the time. If they are to be used on such service as to be lightly loaded for a considerable part of the day, instead of saving coal, as compared with simple engines, they will waste it. The increased danger from the use of high pressure steam—150 pounds—is counterbalanced by making the boilers stronger than usual in the same proportion as the increase in pressure. 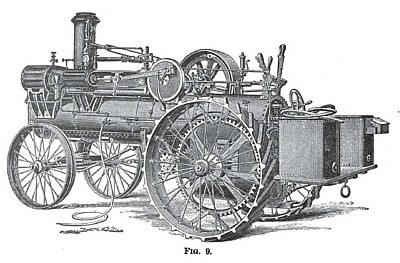 Figure 9 shows a compound traction engine, which, you will see, differs but little in general appearance from the simple engine.